Whether you are using traditional film photography and or digital photography, this photography workshop is perfect for the beginning, intermediate or advanced photographer. Have Fun! Get Inspired! Add to your Portfolio! In this fun, relaxed environment you will photograph side by side with 2 expert photographers, Kim Weston and Randy Efros. Learn more about composition, lighting and improve your vision in this photography workshop! Step back in time with guided historical lectures by archaeologist and photographer, Dr. Ruben Mendoza. Access to photograph in private sectors of the mission normally restricted to the public. 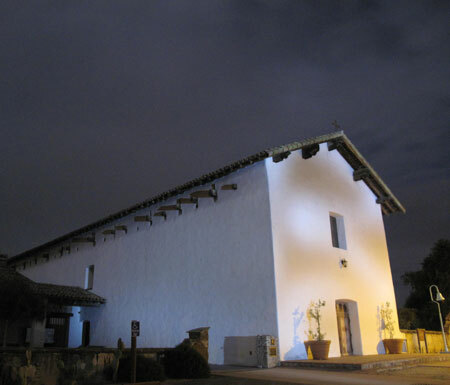 In addition to photographing the San Juan Bautista Mission and the surrounding historical park, we will rise early to catch the first morning light in the surrounding Gabilan mountains. In the evenings we will photograph with mission coordinator Martin Vargas Garcia as we learn to "paint with light" a fun exercise using flashlights at night. I had so much fun learning to do this at Mission San Miguel, last year. For more information about this worskhop. Old Misson San Juan Bautista is located in central California, 40 miles north of Carmel, CA. about 300 miles north of Los Angeles CA. and 93 miles south of San Francisco, CA. Cost: $450 without book participation / $500 with book participation.